My favorite studio is the great outdoors. I love to hike wilderness trails where I see grand vistas or intimate compositions in nature. Much of my work focuses on these elements of nature: rocks and water, mountains and trees, and the patterns of light and shadow that define them. As I paint, I am intensely aware of my surroundings: temperature and smell of the air, ambient sounds of nature and how light strikes the landscape at a particular time of day. 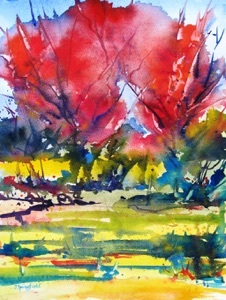 Painting on location or in my studio, I work directly and energetically with watercolors, oils or pencils. Whatever my medium, I like to lose myself in the act of painting and be surprised by the end result. Each of my paintings elicits a memory of being in a special place at a particular moment. I am happy to share this experience with those who view my paintings. Enjoy my paintings of favorite places.